Research has shown that contaminant plumes are often thin and highly stratified. It has also been documented that traditional monitoring wells, with long screened intervals blend the groundwater over the entire length of the screen**. This can mask the true contaminant concentrations and distribution. Multilevel wells with short screened intervals overcome this problem. This high-resolution data gives unprecedented definition of the subsurface contamination, resulting in more effective and less expensive remediation. Water quality data from short-screened wells yield high quality, defensible data. This multilevel system is reliable, easy to install and inexpensive. It provides site assessors with a better understanding of three-dimensional groundwater flow and the distribution of contaminants in the subsurface. Remediation strategies can then be targeted more precisely, focusing efforts in the most effective manner. 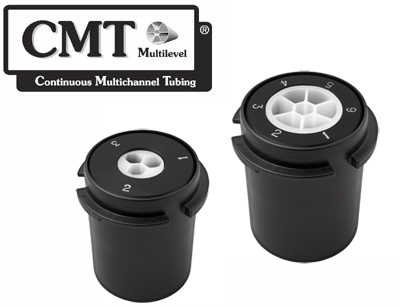 The CMT Multilevel System makes the accurate monitoring of contaminant plumes much more affordable. It provides detailed vertical as well as horizontal data. Monitoring zones are set where needed and the single tube design allows reliable seals between zones. Two systems are available. The 1.7" (43 mm) OD polyethylene tubing, segmented into seven channels, allows groundwater monitoring at up to 7 depth-discrete zones. The 3-Channel System uses the same material and construction, but it is only 1.1" (28 mm) in diameter. This narrow tube was developed for smaller diameter installations, especially direct-push where the annulus for seal placement is narrow. ® Solinst and CMT are registered trademarks of Solinst Canada Ltd.
**Elci et al (2001). Implications of observed and simulated ambient flow in monitoring well.